I didn't look closely at this picture and then took a second look. That really is staying power! Gotta love that determination! Look at him hanging on for dear life! That cracks me up. 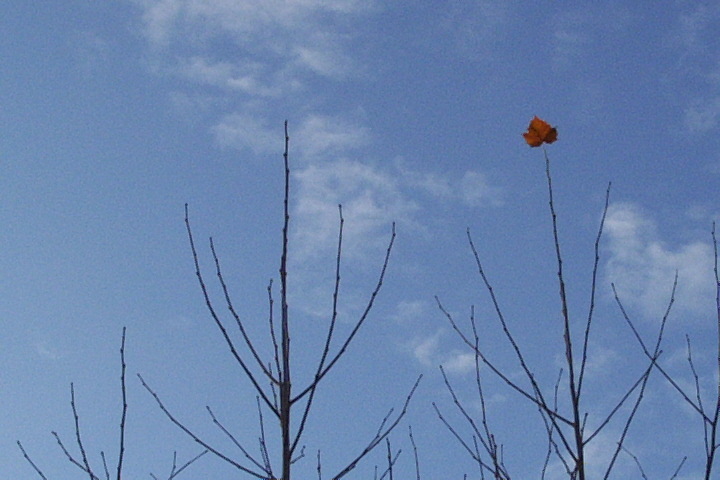 I can just see it, the defiant fall leaf that hung on through winter and spring. Hang in there little buddy. What a great picture. not only is it staying, but it is on the top! what a brave little leaf! Yeah. Right up there at the top, not down in a semi-protected spot where it didn't have to fight to hang on. Get up there with your crazy glue! I don't want it to lose the battle. That is an amazing picture, inspiring. Beautiful picture. It could definitely be one of those inspirational posters! Love the site and the pictures on a daily basis! Hope the wind is sick !!! One very determined leaf. I wonder if its still up there hanging on? Esp. with the current Canadian cold rush we have sweeping into the south. Have a great day Farmgirl! Stay warm! Still looking forward to spring planting -- am seriously considering a "lunar/astrological planting guide" -- have any you recommend? This photo makes me just crack me up, but then I thought it would be an awesome picture to give someone motivation! :) I love you photos keep them coming! Thanks for visiting my blog! Also you shouldn't have problem posting anymore. I should have a warming that says that it get moderated first. Definite determination. I am so glad I caught that photo. I love how so many people have given a "life" to this leaf. "Hang in there little buddy" had me LOLOLOL. I'm just glad I happened to see it up there. Thanks so much, and welcome to the farm! I love the idea of the wind being sick! So nice to hear from you. After reading all these comments, I am realizing that it really is an inspiring & motivating photo. It's so neat to take a picture of something, have an opinion/feeling about it, and then be able to receive all of this feedback from people who are seeing things in a (sometimes) totally different way than you are. What a gift you all give me through these comments!